Will I work the plate or bases? No. Beginner's Mind is best, regardless of level of experience. Both. Which is most important? Both. All games are worked by two umpires and each position demands equal effort. There are too many variables to answer that question, such as meeting attendance, availablity, and the weather. However, if you commit to the training you will be assigned games. Yes. Travel to games beyond Eugene-Springfield is compensated. All sub-varsity games are in Eugene-Springfield or within 10-25 miles except Florence. Yes. An affordable starter's package is available. Many of our umpires also work Babe Ruth which deducts gear. Start-up costs are easily recouped in several games. Will I have the same partner? 4:30 or 5:00 on weekdays. Saturday games (often doubleheaders) are 12:00 or 1:00. Summer leagues begin in late May and play until late July. Game times are after 5:00 on weekdays and vary on weekends. No. You will work with a variety of umpires and be assisted by experienced partners. No. Umpires are independent contractors. If you earn over $600 you will receive a Form 1099 the following January. Bi-weekly in the Spring and monthly in the Summer. Yes: 18. 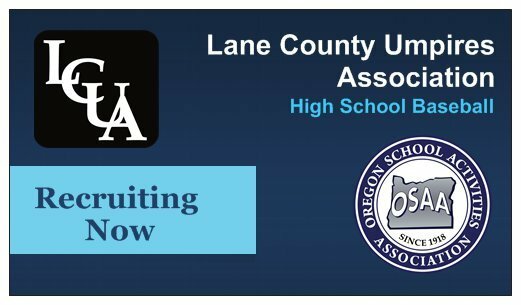 We can petition OSAA to have the age restriction waived. There is no age requirement for ​​​ Babe Ruth.